The sky is a perfect cerulean, with not a cloud to be seen. The water is that wonderful Caribbean aquamarine that you see in pictures. It is 86 degrees in the sun and it’s not even 9 am. The waves roll the boat a bit uncomfortably for some. I can see my husband, Rafael, turning a bit green as he prepares his dive gear. We need to get under those waves quickly. One giant stride off the back of the boat and we are in the 80 degree water. Once the rest of the group joins us, down we go. 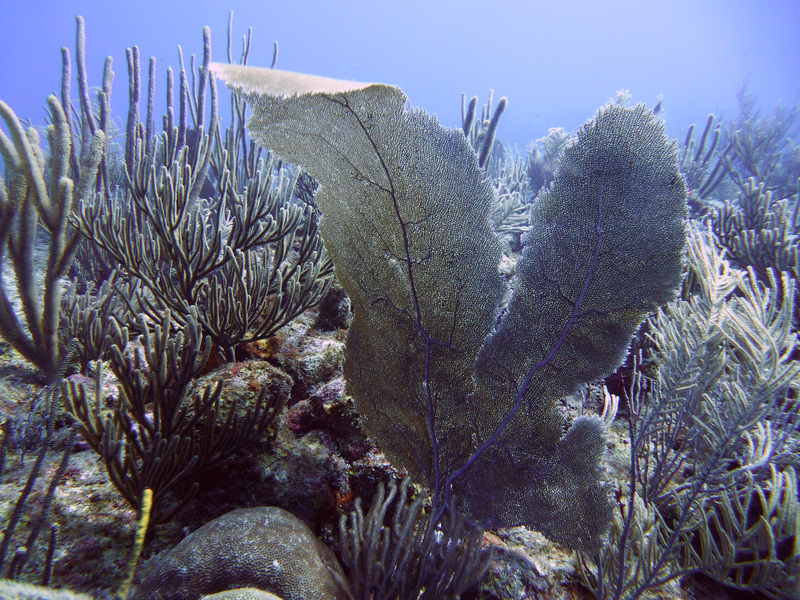 We are diving “La Pared” in Guanica, Puerto Rico and it is a beautiful day for it. The visibility is about 65 feet so there is a lot to see. We follow the wall (la pared) down into what looks like an abyss. I have no idea how far down that goes, but it is very dark down there. I keep waiting for some giant creature to come swimming out of the dark at me. I can’t decide if I want that or not. I love seeing big animals, but I can do without being startled while underwater. 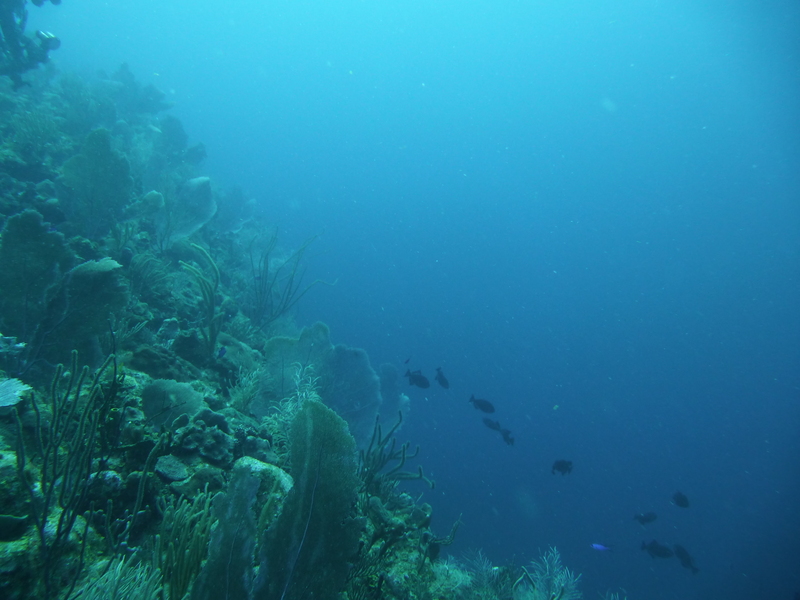 We see black coral, a beautiful spotted eel and some colorful parrot fish on our way down. 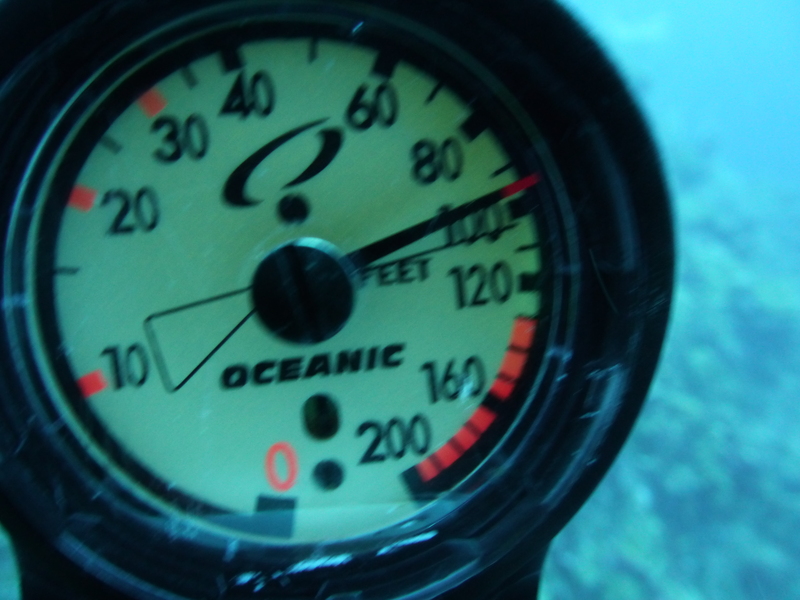 Before I know it, we are at 100 feet, the deepest we have ever been. Actually, to be perfectly honest, I am at 104 because I lose track of my depth, but I don’t think about that because I’m not supposed to go any deeper than 100! It is much easier than I thought it would be. Once your ears have acclimated, there really is no difference between 70 and 100 feet. We enjoy our exploration before heading back to the surface. 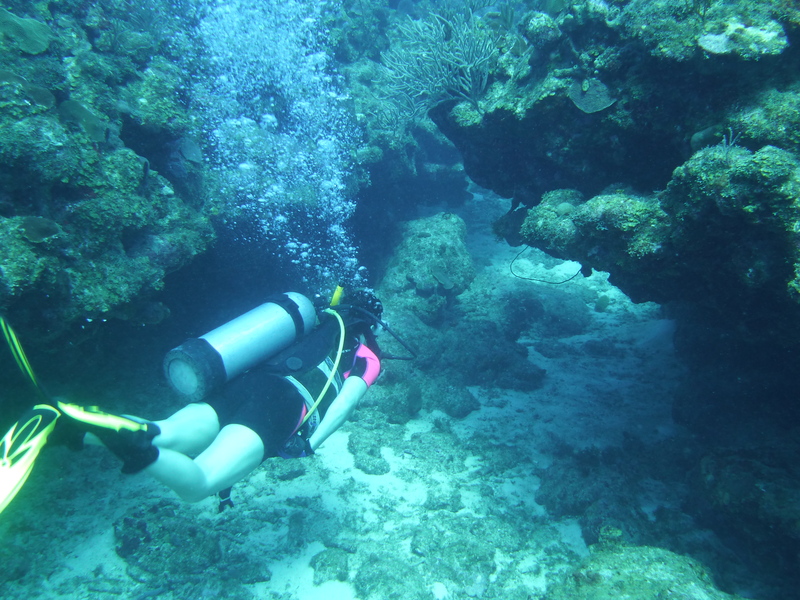 Our next dive is only to about 60 feet but it is just as amazing, like diving in a garden full of coral and colorful fish. 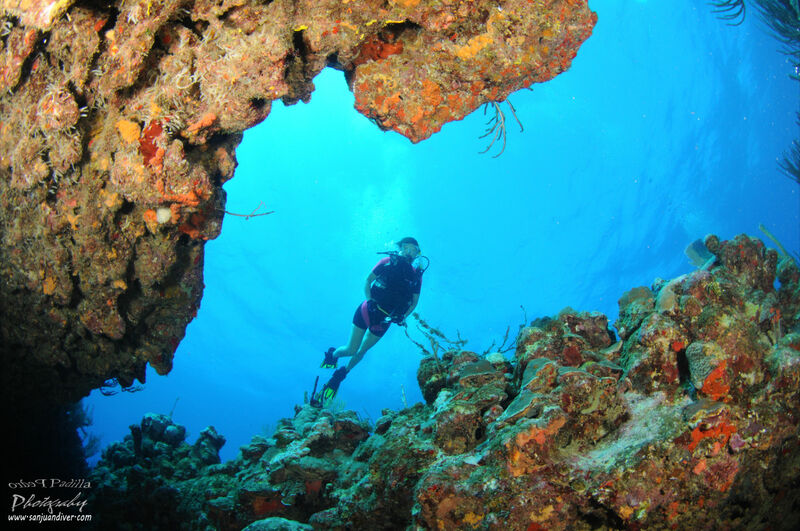 I love this dive because there are caverns and valleys to explore, fish to follow and even a statue of a mermaid, which gives the dive site its name, Little Mermaid. Diving on days like this, at sites like these is why I dive. It gives me an incredible feeling of joy and wonder. If I could smile with a regulator in my mouth, I would. There is nothing quite like this on Earth. You have to be certified for these dives. 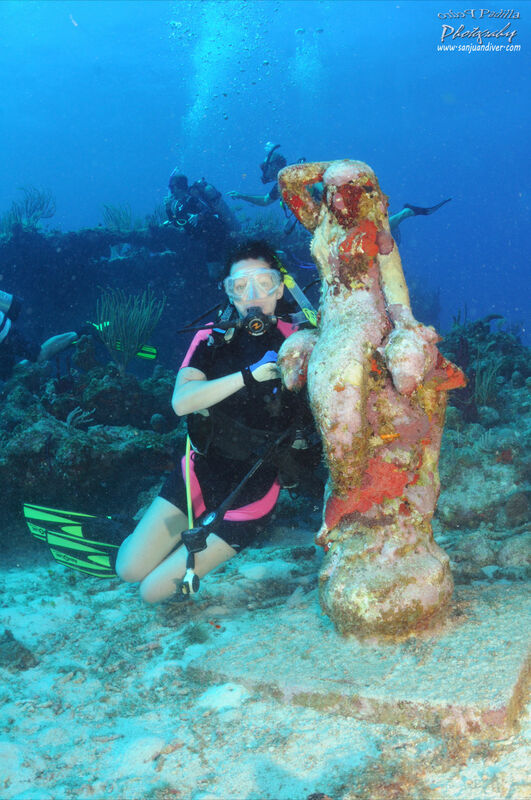 Look for PADI certification in your area. You can do the classroom work near you and then do the certification dives somewhere warm like Puerto Rico if you want. Rafael and I didn’t do that. We dove in the ocean off Maine for our certification. It was awfully cold and the only thing we saw was lobsters!